It is easy to use WooCommerce to build an online store. 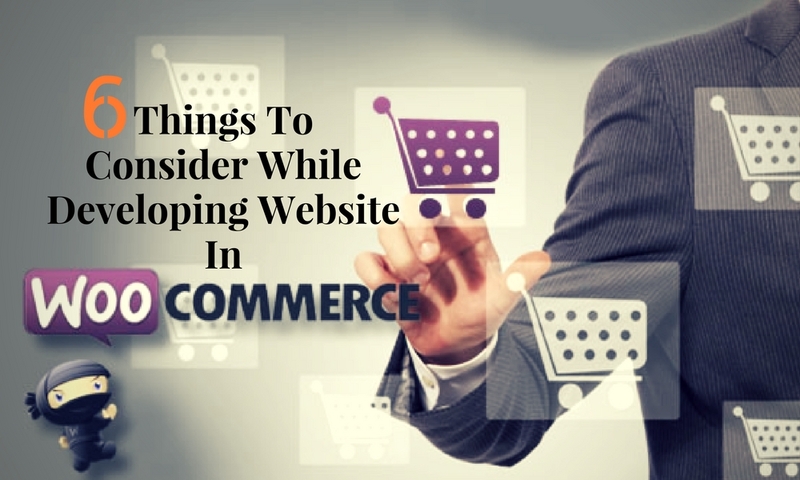 However, you should not rush into the task but take your time to think about crucial considerations before launching your eCommerce website. According to a report, Global eCommerce is booming with sales expected to touch $27 trillion by the year 2020. This has led to the growing popularity of suitable software solutions as indicated by the eCommerce software awards for 2017. In this article, we have outlined six key considerations you can use to develop a viable plan before undertaking your eCommerce project using WooCommerce. First and foremost thing to do while beginning with the web development in Woocommerce is to determine what you are going to sell and how it is useful to your targeted audience. Is it digital goods such as video games, apps, eBooks etc. or physical goods such as food, textiles, clothing and others? Be clear about the nature of your business before you start developing your site in WooCommerce. You must know what are you selling and how this business would help your customers. Knowing your market will even help you increase the ways you can expand your business. With a perfect research, you would be able to find out if the woocommerce website would succeed or not! Location is important for business success. This includes your business location as well as that of your buyers. Are you planning only an online store or a brick and mortar outlet as well? Do you plan to sell your goods internationally as well as offer in-store pickup and local delivery? Shipping expenses depend on the weight as well as the volume of the product. If you plan to ship heavy and large products, utilize a calculator to get an idea about the costs involved. Find out the details of the tax setups in the locations you plan to do business. Get information on applicable taxes as well as tax exemption details. WooCommerce utilizes a database that stores your site’s critical data. This includes information about your sales and products. Therefore, you should plan to take periodical backups of your website’s databases and files. The frequency and type of backups depend on your business requirements, but keep in mind that backups are crucial even for small stores. Loss of information can lead to incorrect inventory and reduced sales. So, never miss to take backup of your data when using woocommerce website. You can use WooCommerce to provide a wide range of coupons and discounts to your customers. These special offers can boost sales, but you need to calculate the costs involved in advance. Make sure the discounts are good enough to encourage customers to buy, but not too high to affect your profits. Discounts and coupons are the most efficient things to gain attraction of any customer to reach to your woocommerce site for the first time. It can help you to create your website a greater brand. And better the branding, more will be the sales in the business. How are you going to build relationships with your buyers? Will you allow them to create their own accounts or will they have to always use the portal as guests? Another crucial consideration is data security. You need to ensure your website can securely store confidential information such as credit card details. Allow your customers to store this info on your site so that they can do repeat transactions quickly and easily. To ensure, customer data is safe you need to implement industry security standards such as PCI compliance. If you do not wish to provide the choice of storing sensitive information, you can allow your customers to make payments through PayPal and similar gateways. This will enable buyers to pay using the services of a third party. Before starting to use WooCommerce, it is advisable to get familiar with WordPress basics. If you jump straight into WooCommerce you may find it too big a leap. Learn things step by step and become a WordPress dvevelopment expert first. Then, you can build your eCommerce website using WooCommerce and successfully launch your online store. WordPress is the first step towards the WooCommerce business, if you know WordPress, it will be easier to handle the website and will make your efforts low. Ultimately, it will help you increase profit of your business and turning to woocommerce will be proved helpful to your website. We hope this article proved useful to you as you plan to use WooCommerce for your eCommerce business. To reiterate, identify your market and location, and decide your relationship with your customers. Implement the considerations outlined in this article and feel free to provide us feedback on the results of your eCommerce venture.